The 15-year NHL defenseman made the most of a rare shootout opportunity, scoring in the 13th round to lead the Tampa Bay Lightning to a 3-2 win over the New York Islanders on Thursday night. The shootout was tied at four through 12 rounds before Salo put a backhander past Evgeni Nabokov. Ben Bishop preserved the win by making a glove save on Johan Sundstrom. Ryan Callahan had two goals for the Lightning, who trail Montreal by two points for second place in the Atlantic Division. Tampa Bay, 6-0-4 in its last 10 games, has two games in hand on the Canadiens. The Islanders, out of the playoff race, got goals from Ryan Strome and Matt Donovan. Right wing Kyle Okposo, who has a team-best 27 goals and 69 points, was a late scratch due to a lower body injury. All three games between the teams this season were decided in a shootout, with the road team winning the first two. 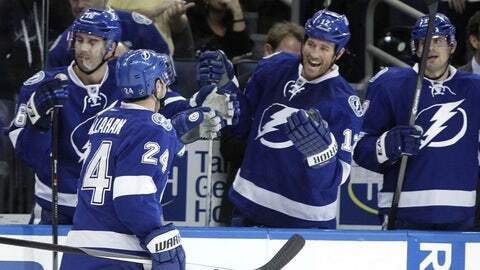 Callahan pulled the Lightning even at 2 on his second goal of the game, coming on a rebound 5:50 into the third. ”We didn’t have our best game, but really willed a way to win,” Bishop said. Donovan put the Islanders up 2-1 while lunging forward in the slot at 9:17 of the second. It ended the defenseman’s 39-game goal drought. After Callahan redirected Radko Gudas’ shot past Nabokov just 29 seconds into the second, Strome put a shot past Bishop to tie it at 1 at 1:33. New York had a short-handed goal by Hamonic from center ice waved off due to an offside call in the second. Hamonic stole Bishop’s errant long-range pass from the corner and put the puck into the vacated net. The Islanders failed to score during a 5-on-3 power play early in the third. Tampa Bay came up empty on a power play that covered the final 69 seconds of overtime. NOTES: Tampa Bay C Valtteri Filppula had an assist to extend his point streak (10 assists, 14 points) to 10 games. … The Islanders recalled forward John Persson on an emergency basis from Bridgeport of the AHL. Persson, selected in the fifth round of the 2011 draft, made his NHL debut.